If you are into cars, you have probably heard about the torque converter before and the problems associated with it. 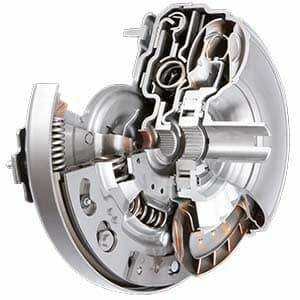 Torque Converters can be found in almost all older automatic transmission cars and also in a lot of modern cars. That is also probably one of the reasons why you have heard about so many torque converters that have failed. In this article, you will probably find all the information you need about the torque converter. You will find information about how it works, the most common symptoms and causes and how to test the torque converter. If you can’t find your question just comment at the bottom of the article. There are several strange symptoms that can occur when it comes to a bad or failed torque converter. Here is a list of the most common and the most noticeable symptoms that you can have in your car. A very common symptom when it comes to a faulty torque converter is that the transmission is slipping when you are accelerating. You can feel this when the engine is revving up a lot on the gear drive while the car is not accelerating against the RPM’s from the engine. Often you have to have a bit of feeling of your car to recognize slippings. Rough Idle is another common symptom. If you are feeling that your idle is a bit jumpy and sometimes too low and sometimes too high, it could be a problem with the torque converter. If the torque converter is faulty you can get a lot of different pressures inside of it, which will cause rough idle. Rough acceleration is also a known symptom when it comes to faulty torque converters. This can both be caused by different pressure spikes in the torque converter or the fact that it’s slipping like discussed before. If you are feeling that you have rough acceleration, check your rpm meter to see if it’s jumping a bit on acceleration. If this is the case, it’s probably a failed torque converter causing it. If your car won’t move at all in drive or reverse gear, there might be a completely failed torque converter that is causing it. However, a car that won’t move in gear can be caused by a lot of different things and it should be diagnosed properly before you are replacing it. When the torque converter is slipping while you are driving, it can cause unnecessary heating of the transmission fluid which may even get so hot at a point that it will boil. A slipping torque converter will wear out the transmission really fast. In some cases, you have temperature sensors which will flash the transmission control unit light on your dashboard, which is an indicator that your torque converter is slipping. Listen on both idle and while accelerating if you can feel or hear any strange noises from the torque converter. Listen in the middle of the car under the gearstick if you can hear any clonks or other strange noises. If you hear any noises, lift up the car and see if there could be other things that are causing the noises before replacing the transmission torque converter. What is the function of the torque converter? The torque converter is the unit that transfers the force from the engine to the transmission gears in a smooth way. In short, the torque converter is filled with transmission fluid and have a “fan” or turbine like unit inside of it. The more it spins the higher pressure it will create inside the unit and the more force from the engine will be transferred to the transmission. For an example, if you take two fans against each other and start one of the fans, the other fan will also start to spin, but not directly with the speed as the other fan have. This is exactly how a torque converter works. As you probably can figure out, because of this you will get a very smooth power transfer between the engine and the wheels. However, there are also some negatives about this. Because of the no direct connection between the engine and the transmission, you are losing some power from the engine and the engine will become less efficient. This is often why older transmissions are having a higher fuel consumption than a manual gearbox car. To prevent this problem, newer automatic transmissions are using a traditional manual gearbox with a wet or dry clutch, and they are letting a robot controlling the gear shiftings and clutch for you. These are called DSG transmissions and are much more efficient than traditional automatic transmissions. When it comes to torque converters there are some common problems that are happening to them. Overall, the torque converter is not a very advanced part on older cars and there are not very much parts that could fail. Sometimes you can find cheaper complete torque converters and in this case, there is not worth it to take it apart and replace parts inside of it. A very common problem is that the torque converter bearings will get worn out. This does often not cause any slipping or other problem with the transmission, but it can create bearing noises from the transmission. If you hear any bearing noises from the transmission, check the transmission fluid and check if you can see any metal pieces inside of it. If you can find metal pieces they are probably coming from a faulty torque converter bearing. A faulty torque converter seal will cause the transmission fluid to leak out from the torque converter and this will cause it to lose pressure inside of it. Low pressure inside the torque converter will cause it to slip and overheat and other strange symptoms. This is actually one of the most common problems when it comes to a faulty torque converter. 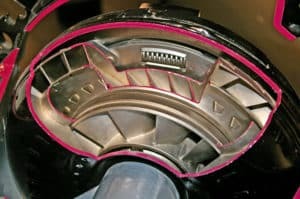 A torque converter has several clutches inside of it. If the torque converter is locked up into drive and the neutral is not releasing the transmission, you do most likely have a problem with the torque converter clutch. 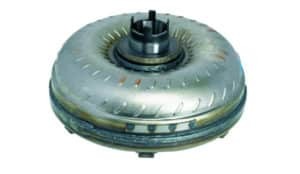 A faulty converter clutch can also cause other symptoms like slipping and rough acceleration. The torque converter clutch solenoid is a common part to fail inside the automatic transmission. The solenoid controls the hydraulic transmission fluid pressure that is going into the lock-up clutch. This can cause several symptoms like slipping, overheating and rough acceleration. So now when we know how a torque converter works, and the most common symptoms and causes of it, it’s time to check how we can actually repair our torque converter and what parts we should replace. Here are some of the solutions that could be made when you are having problems with your automatic transmission. The first thing I always do when it comes to problems with the transmission is to replace the transmission fluid and inspect it. Tap out the transmission fluid and check for any signs of metal pieces inside of it. If you can find metal pieces you do most likely have worn out torque converter bearings. Also, check the colour of the transmission fluid, if it’s brown or almost black, it’s definitely time to replace the fluid and filter if the car has one. A transmission fluid replacement is pretty cheap compared to a torque converter problem and it can cause a lot of different problems. So, my recommendation is to always replace the transmission fluid first and maybe even to a transmission flush if the fluid is really worn out. If you find any metal pieces inside the transmission fluid it’s time to remove the transmission from the engine and visually inspect the bearings inside the torque converter. Metal pieces can also come from other failed parts inside the transmission, but the most common is from the torque converter bearings and that should be inspected first. If you are experiencing a slipping torque converter and you have replaced the transmission fluid and filter and even done a transmission flush to it, it’s time to remove the transmission from the engine and inspect the seals on the axle into the transmission. Here is a video of how to replace the seals inside a transmission. If you are experiencing any lockup problem or that your transmission is stuck in direct contact with your engine RPM on all gears, it’s time to visually inspect the torque converter clutch and the solenoid for it. To check this you have to take the torque converter apart. What colour is the transmission fluid? There are not a lot of things you can do to test the torque converter without taking it apart. But, there is a way you can check for any signs that the torque converter is worn out. Here is a way that I’m normally using to check for any problems with the torque converter. The first thing you should do is to start the engine and let the transmission fluid get warm around 40 degrees. This can take a very long time and it’s recommended to check the transmission fluid temperature with a diagnostic scanner to be sure that the transmission fluid is warm. When the transmission fluid is warm it’s time to go to the next step. Now you can try to apply the drive gear and listen carefully if you can hear any signs of a noise from the torque converter. The torque converter should move the car forward with a just a slightly tap on the acceleration pedal. The shift between the other gears, Drive and sport if you have it to see if you can hear any other noises from it when doing so. If everything seems okay you can go to the next step. Now it’s time for you to drive the car at higher speeds. Keep an eye on the tachometer and the speedometer and make sure that the engine is not revving up a lot when you are pressing the acceleration pedal but the car won’t accelerate. If this is the case the torque converter is slipping. However, all older automatic transmissions have a bit of slipping when accelerating but if you have owned the car for a while you do probably know how much it should slip. If you are not sure, let a mechanic test drive your car and see if he/she can hear any noises or feel any slipping. Where is the torque converter located? The torque converter is located between the engine and the automatic transmission. To diagnose it properly and visually inspect it you have to remove the transmission from the car and the engine. Some older American cars do have a cover plate which you can remove to inspect the torque converter. However, even with them, you won’t see much because the torque converter is a sealed unit. I do always recommend to remove the torque converter from the transmission to diagnose it properly. If you have followed this guide and realised that your torque converter is worn out and you want to replace it, you do probably know how much it cost to replace it also. This depends a lot of if you want to do the job yourself or let a mechanic do it for you. Because as we discussed before, that you have to remove the transmission from the engine to replace the torque converter it’s pretty time consuming and you could get a high labour cost. If you want to replace it yourself and you feel that you have the knowledge, there is much money to save. A new replacement torque converter costs anywhere from 100-400$ depending on the car model and the type of converter. The labour cost of the replacement of the torque converter is anywhere between 200-1000$ depending on the car model and the workshop that is doing the job for you. You can expect a replacement time of between 3-12 hours for a replacement of the torque converter, depending on your skills and experience. Now there are not very much left to discuss about torque converters. If you have any other questions or want us to add anything to this article, comment down below and we will answer your questions as soon as possible. I hope that you liked this article! From the information I can find, the P2008 on Mercedes is referring to the electronic selector lever module – control unit fault. There is a known problem with the shifter itself. Sometimes liquids could get into it and destroy it. I think you should let a mechanic take a look with a Mercedes diagnostic tool, in this case, to test out all the maneuvers of the transmission with the tool. @Veneet If they are replacing the torque converter on warranty, you should absolutely do it. A faulty/Leaky torque converter can also cause pressure losses in the transmission and give a lot of strange symptoms. However you could also try with a transmission flush/fluid and filter replacement first, but if they have diagnosed and found a problem with the torque converter, it may be so.